I present to you Parmesan Black Pepper Biscotti. That's right. Biscotti. Made with parmesan and black pepper. Wait, what? Where's the chocolate? Where are the almonds? Where are the cranberries? Where's all that sweet goodness that is the biscotti we know and love? Well, who says a cookie can't be savory, huh? Not me. The Creative Cookie Exchangers may have called for biscotti this December but they didn't say it had to be SWEET. Okay, so maybe, just maaayyybeee I'm stretching it here. Sticking to the letter, if not the intent of the law. Call me a rebel. Or a Grinch. I don't know about you, but right about now I'm pretty much over the sugary sweetness of the season. What with the fruitcake and the cookies and the candy canes and the truffles, yeah. Over it. I'm ready for something with a savory kick. So bring on the black pepper. And the cheese. Cheese. CHEESE. CHEEEESSSSEEEE. I'll take cheese over chocolate any day. These little munchies bake up quickly and easily, and I found them a bit less tetchy to slice than their sweet counterparts—less crumbly, I thought. The recipe also makes a LOT of biscotti, which you will definitely appreciate once you get a taste. And because it can't be said enough…Cheese. Ch. Eese. So come on, be a rebel too. Down with sweet! Up with savory! Say CHEESE! Happy Dunking! 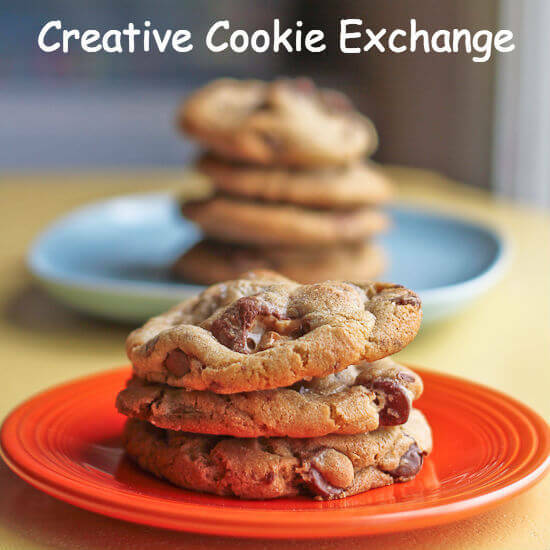 And don't forget to check out the links below to see what the other Creative Cookie Exchangers baked up. Preheat your oven to 350°F, with racks in the upper and lower third. Line two baking sheets with parchment. In a large bowl, add the flour, baking powder, salt, 2 cups of the grated cheese and 1 tablespoon of the ground pepper and whisk together. Add in the butter and work the mixture with a pastry blender or your fingers until it looks like coarse sand. Blend the three eggs and milk with a whisk, then add to the flour mixture and stir together until you have a soft dough. Turn the dough out onto a lightly floured work surface and divide into four portions. Shape each portion into a slightly flattened log, about 12 inches long, 2 inches wide and 3/4 inch high. Transfer the logs to the baking sheets about 3 inches apart. Whisk the remaining egg until blended then brush the top of the logs with the mixture and sprinkle with the remaining cheese and peppercorns. Bake for about 30 minutes, switching racks and turning the sheets halfway through for even baking. The logs should be pale gold and feel set. Transfer the baking sheets to wire racks to cool for about 10–15 minutes. Transfer each log to a cutting surface and with a serrated knife, cut into diagonal slices about 1/2 inch wide. Place the slices back onto the baking sheets, cut side down, then bake again for about 35–45 minutes, turning the slices over midway, until they're crisp and golden. Being an extremely efficient (read: lazy) person, I like to save time by standing my cut biscotti on end, rather than flat, when baking for the second time. You will thank me for the precious seconds you save by not having to take them out of the oven to turn them over. You're welcome. A biscotti bonus—play with your food. It's Biscotti Jenga!